"It has to do with our fascination of fire and our laziness," he said. "How can we get fire"—or heat—"to do work for us?" Now, Murch and colleagues have taken that most human enterprise down to the intangible quantum scale—that of ultra low temperatures and microscopic systems—and discovered that, as in the macroscopic world, it is possible to use information to extract work. "We've experimentally confirmed the connection between information in the classical case and the quantum case," Murch said, "and we're seeing this new effect of information loss." That we can get energy from information on a macroscopic scale was most famously illustrated in a thought experiment known as Maxwell's Demon. The "demon" presides over a box filled with molecules. The box is divided in half by a wall with a door. If the demon knows the speed and direction of all of the molecules, it can open the door when a fast-moving molecule is moving from the left half of the box to the right side, allowing it to pass. It can do the same for slow particles moving in the opposite direction, opening the door when a slow-moving molecule is approaching from the right, headed left. After a while, all of the quickly-moving molecules are on the right side of the box. Faster motion corresponds to higher temperature. In this way, the demon has created a temperature imbalance, where one side of the box is hotter. That temperature imbalance can be turned into work—to push on a piston as in a steam engine, for instance. 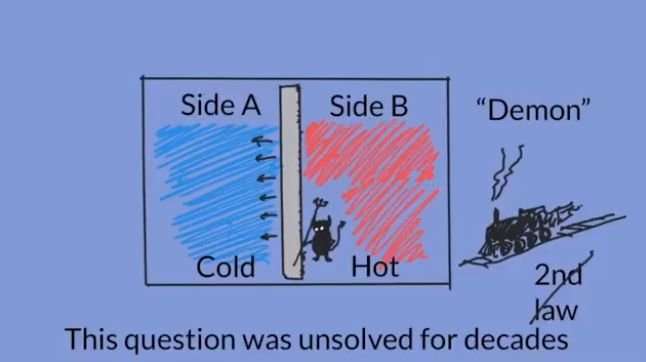 At first the thought experiment seemed to show that it was possible create a temperature difference without doing any work, and since temperature differences allow you to extract work, one could build a perpetual motion machine—a violation of the second law of thermodynamics. "Eventually, scientists realized that there's something about the information that the demon has about the molecules," Murch said. "It has a physical quality like heat and work and energy." "But the demon misses some photons," Murch said. "It only gets about half. The other half are lost." But—and this is the key—even though the researchers didn't see the other half of the photons, those photons still interacted with the system, which means they still had an effect on it. The researchers had no way of knowing what that effect was. And who needs information with a symmetric protocol? The information can be negative. Now this is interesting. If there is a connection between information and energy even in the negative sense...hmm...maybe we can go the other way and turn negative information into negative energy? "They took a weak measurement and got some information, but because of quantum backaction, they might end up knowing less than they did before the measurement. On the balance, that's negative information." And what is the practical implication of this brainfart? The practical application is that you can have effect before cause (which is what negative information basically means). That's pretty big. Not the smartest in the room, but if there is, what are the implications? If not, why not?